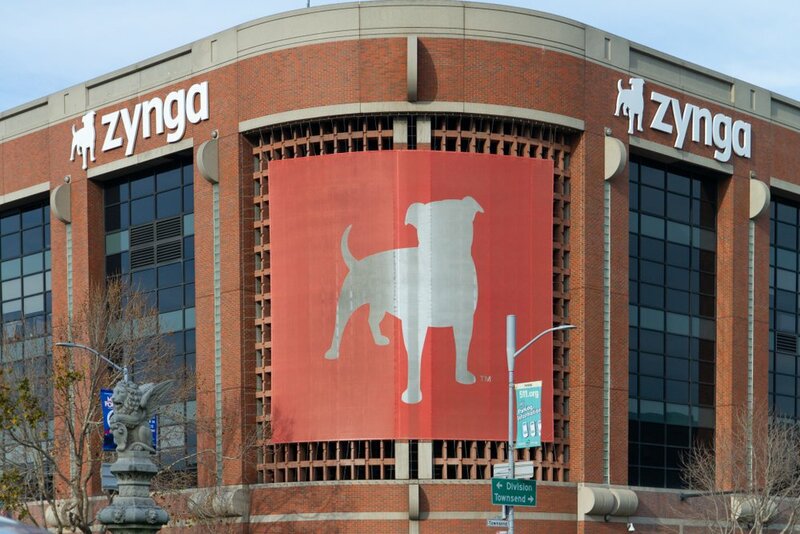 This is happening at the same time 30+ U.S. banks have backed new p2p payment app, Zelle. Shortly after Zelle launched, we did some preliminary research on it here. The fascinating thing is this feature was already live within all of the partner bank apps but they determined it would be best to have a standalone app as well. 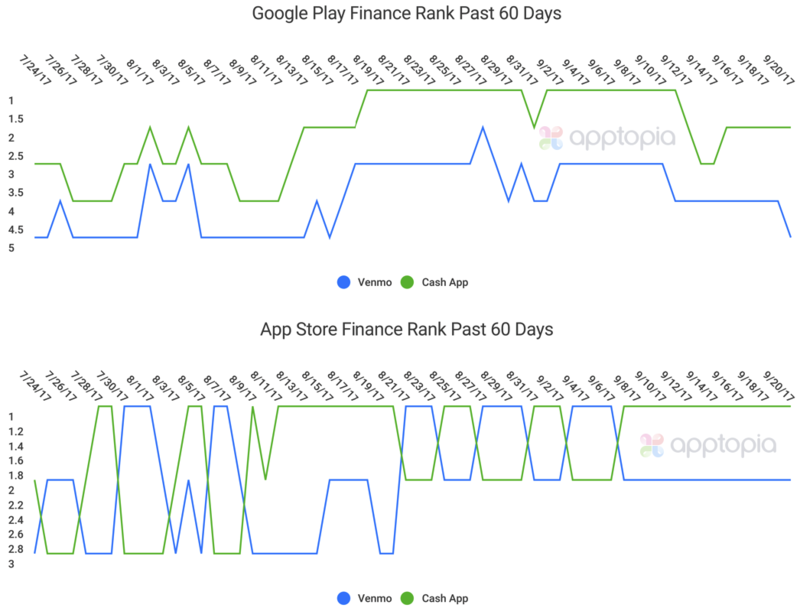 As of this writing, Zelle ranks #15 in the Finance category of the App Store and #17 in Google Play. These are higher ranks than both Venmo and Cash App had for a while after their respective launches. 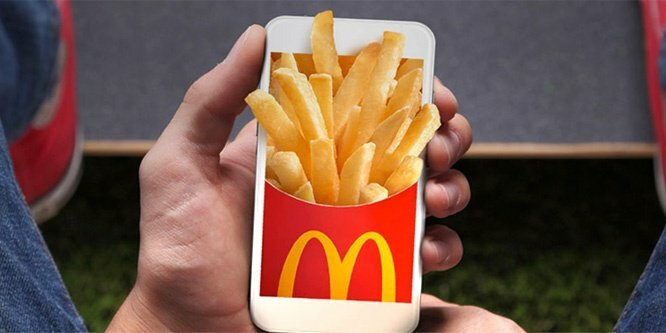 I contribute this to timing as we now have a more mature app economy and an educated consumer base surrounding digital money transfers. Much of our analysis has to do with rank, which places an emphasis on download velocity. 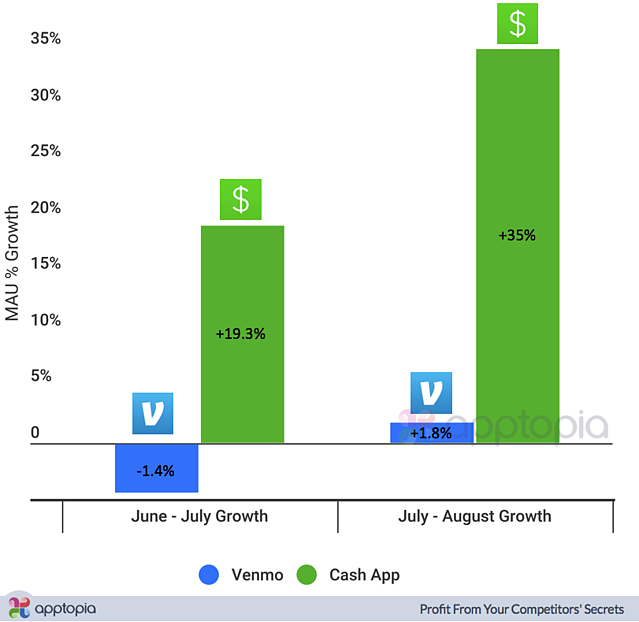 Both Venmo and Cash App have a consistently higher user retention rate than the Finance category average which is about 7.5% for 30th day rates in both major app stores. 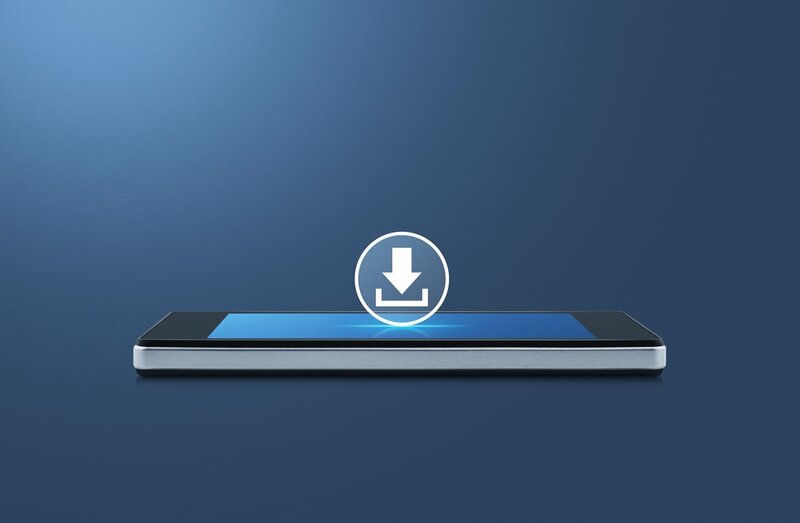 Because of their solid retention rates, downloads are translating into active user growth. 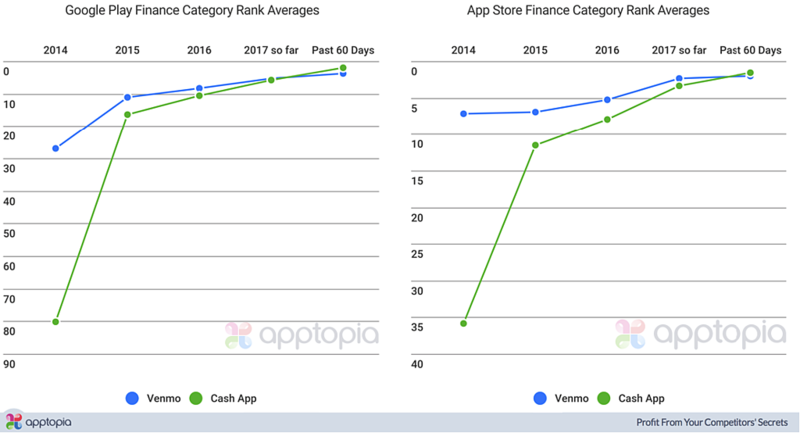 As you can see from the chart above, both apps have risen consistently over the years, and each year, Cash App has been closing the gap. At some point in late 2015, the app renamed from Square Cash to Cash App, helping its app store search optimization. A little earlier, a big story hit unearthing how easy it was to get scammed on Venmo. This no doubt worried consumers. Even today, stories of Venmo scammers persist. I have and use both apps. They both work completely fine and the only reason I choose one over the other is convenience to the person receiving the money. I don’t want to make my counterpart download one of the apps when I already have both. 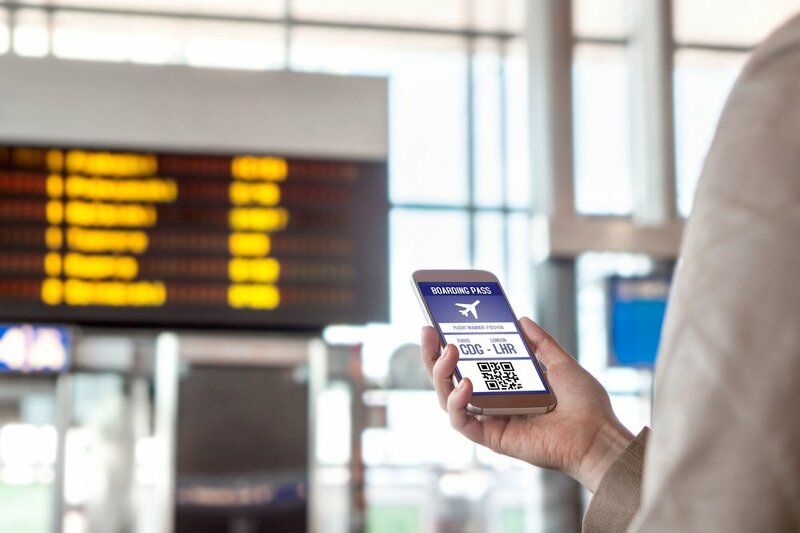 In 2015, Square enabled its merchants to accept payment through the Cash App, creating a new source of revenue for the company. Venmo just initiated this for PayPal businesses earlier this month. 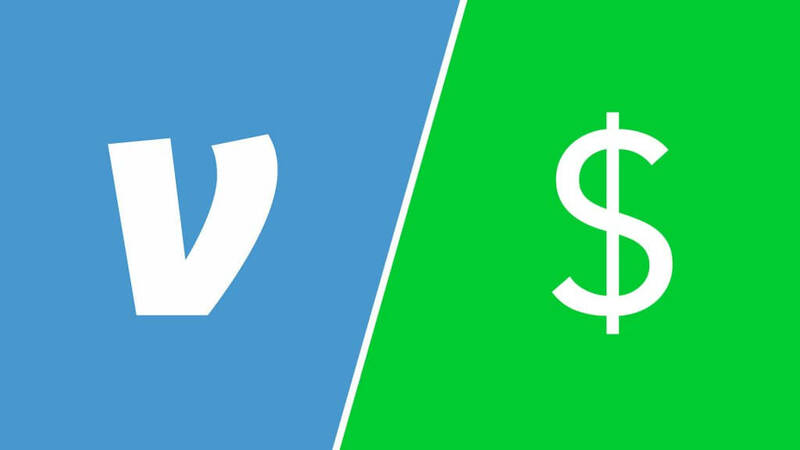 The big differentiator between these two apps is that Venmo has a social aspect which many find fun and intriguing. When asked about the launch of Zelle, PayPal COO Bill Ready said he believes it’s this social aspect that will keep users engaged and retained with Venmo. Get your hands on in-depth data and visualized analysis with Apptopia. Interested in learning more? Contact us or schedule a demo.